How do you tell a story to your grandchildren when you've found yourself alone, oceans apart from your family? For 75-year-old South Korean grandfather Chan Jae, it meant embracing the new and unfamiliar world of social media. With his wife and son's help, Chan Jae turned to Instagram, using his account as a storytelling tool to share the pictures he draws by hand for his beloved three grandsons. His account, Drawings for my Grandchildren, now has more than 40,000 followers enchanted by his imaginative creations. Its success isn't entirely by chance. It was the brainchild of his son Ji Lee, a 45-year-old creative lead at Facebook, which owns Instagram. The family emigrated to Sao Paulo from Seoul in 1981. But Ji Lee eventually relocated to New York while his sister and her husband made the decision to return to Korea with their two sons, who were the centre of Chan Jae's world. "My father was retired and spending time with my nephews, like driving them to school, was a huge part of his day. After they left, he had nothing to do and that scared my mother and me," said Mr Lee. "We were very worried that he would age quickly without having anything to do and would become depressed." Image caption "Are you guys learning Tae Kwon do?" It took him months to convince his "quiet reserved" father who "hated learning new things" that he should draw for his grandchildren, as he had for his children, and post the pictures online to stay in touch. "He hated the idea and just could not grasp the concept. He didn't understand the purpose of why we wanted to share his art on Instagram but I was determined to teach him," he told BBC News from his home in New York. "But I sat down with him every day and at dinner one night, we had a conversation about drawing for my son. That was the turning point and eventually he became more receptive to learn." "Capturing his style of drawing" was another big struggle he faced. "Now he uses different editing tools and can even understands hashtags so that was revolutionary." "This Instagram account really changed my father's life. Since then, he's been making one drawing a day. My mother writes the stories and my father brings them to life." 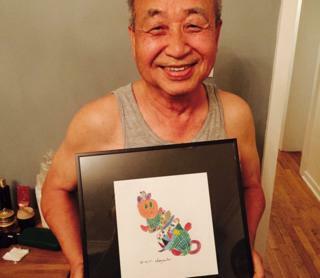 Dinosaurs, pandas, superheroes and nature are all common themes in Chan Jae's work for his grandchildren. The daily life and culture of Korea also feature prominently. More importantly, each post teaches a lesson, shares a memory or even carries a personal message. They are translated into three languages: English, Korean and Portuguese. "Your grandma is a super woman. She's carrying a baby in front and another on her back. Children, please don't forget," read one heart-warming post. To take things a step further, Ji Lee told his father's story through a video on Facebook which went viral, gathering more than 18,000 reactions and 1.3m views on the site. He said he was shocked by how popular his video had become. "I went to bed and when I woke up, it had gone viral. The Instagram account has also grown and he now has more than 40,000 followers." Thousands of users on Facebook wrote about how Chan Jae's story touched them. "This is amazing on so many levels. A modern living legacy. Your brilliance has so much depth," said Valerie LaMastro. Others like David Harvey shared similar experiences with getting elderly people to make use of technology. "That's a wonderful story. Beautiful drawings and a beautiful job telling the story, too. My father also had little to no interest in technology until texting and now it has brought us much closer together." Devrin Carlson-Smith said: "I was one of the first to follow 'Drawings for my Grandchildren' and told you the story of how I got my mum into Instagram. I love that your dad is back into his art. I hope to do that too so I don't lose my skills." To Ji Lee, the most rewarding part of this all was helping others around the world. "There were hundreds of messages saying our story inspired them to speak to their own aging parents. It takes a lot of patience and empathy to teach someone like my father to see the meaning and joy of starting a project using a new technology, but for us it has been incredibly rewarding and transformational."